Federal authorities have questioned a former chief of staff to ex- Gov. 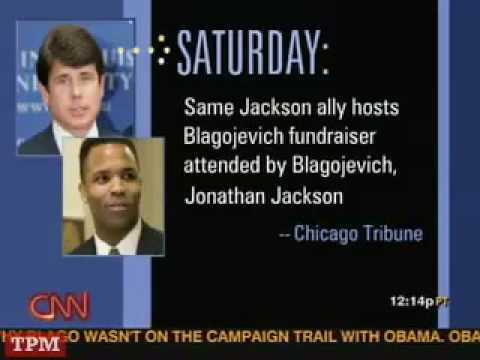 Rod Blagojevich and other cooperating witnesses about an attempt by friends of Rep. Jesse Jackson Jr. to raise funds for Blagojevich to encourage him to pick Jackson for the U.S. Senate, sources said. A federal grand jury investigating alleged corruption in the Blagojevich administration is expected to hear from witnesses about the fundraising effort in coming weeks, sources said. Federal prosecutors allege Blagojevich, who was indicted last week on corruption charges, was considering awarding the seat to Jackson in return for a Jackson associate offering $1.5 million in campaign cash. Rep. Jesse Jackson Jr. (D-Ill.) acknowledged Wednesday that he is the subject of a preliminary ethics investigation into his relationship with indicted former Illinois governor Rod Blagojevich and his efforts to win appointment to the Senate seat vacated by President Obama. Jesse Jackson Jr, confirmed that he is the subject of a inquiry on congressional ethics, stemming from accusations that he was part of the Illinois Gov. Rod Blagojevich scandal. A scandal, that says he was "Senate Candidate A", in the case against Blagojevich, who attempted a "pay to play" scheme and offered Obama's vacant Congressional seat, to the highest bidder.